Get down like a high roller… all to support an incredible local organization! 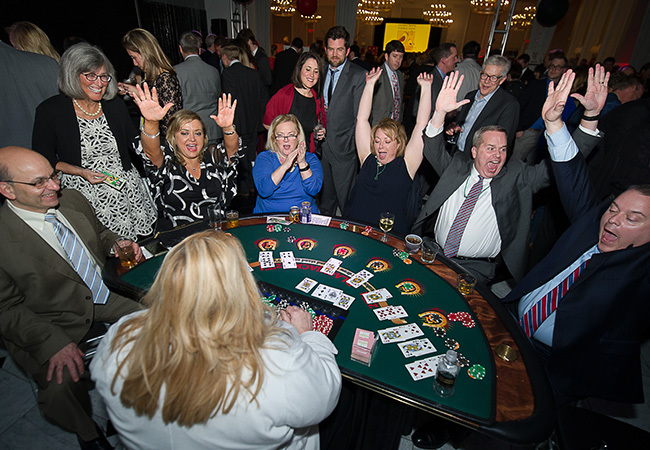 On Friday, March 8, 2019, Lexington Hearing & Speech Center (LHSC) will celebrate their mission at The Carrick House with casino games, a silent auction and fantastic hors d’oeuvres and cocktails. 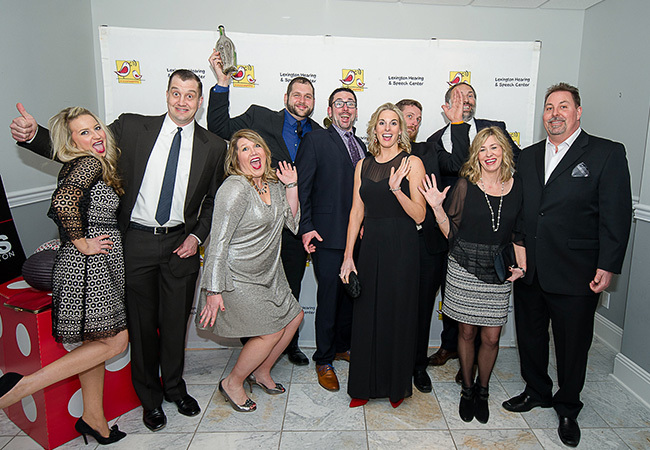 This annual event is an evening jam-packed with fun for a truly amazing cause. All proceeds from the Frankel Cocktails & Casino Night go towards the LHSC’s mission of teaching children to listen and talk. Lexington Hearing & Speech Center provided services to over 1,200 families from over 65 counties across the Commonwealth last year. Their goal is to ensure that no person is defined by their communication delay. Early childhood education, speech-language therapy and audiology services are available to any child with hearing loss and other communication impairments. The LHSC was founded in 1960. A group of Lexington area parents approached Edie and Jimmy Frankel to ask for their assistance in establishing a program to teach speech skills to their children with hearing impairments. Mr. Frankel, an architect and engineer who had been deaf since birth, and Mrs. Frankel, who had a hearing loss, decidated their lives to active community participation for the hearing impaired. The Frankel Cocktails & Casino Night helps LHSC provide services to children and adults, from low income families, so that everyone has a sound beginning, no matter their ability to pay. Want to support the LHSC or learn more about their services? Tickets and information are available at lhscky.org. Sponsorship opportunities are also available for this event. If you’ve driven past Ashland: The Henry Clay estate, you have have noticed a new sculpture at the corner of Sycamore and Richmond Road. The piece was created by local artist Kiptoo Taurus, who creates large-scale wooden sculptures. This work depicts a Thoroughbred’s head as it drinks water. The Kenyan-born artist titled the sculpture Meji Mazuri, which means “Good Water” in Swahili. Carved from a tree stump on the property, the piece reflects the history of Henry Clay’s involvement in America’s equine tradition. Clay was an early patron of horse racing. He bred horses and was a member of one of the first syndicates in the United States to purchase a Thoroughbred stallion for racing and stud services. The piece was funded by the LFUCG Corridors Commission and matching funds from the Henry Clay Memorial Foundation. Following months of work, Meji Mazuri was dedicated in January. Brides across the Bluegrass should discover Relix, a bridal gown boutique with over 100 styles from designers around the world. Open seven days a week at The Summit, it’s a convenient, fashion-forward choice for busy brides who are seeking the perfect wedding day look. Carrying brands like WTOO by Watters, Justin Alexander and Lotus Threads, their gowns have modern sensibility that fits with a wide range of wedding styles. They also carry accessories, bridesmaids dresses and more. Located on North Limestone, Pearl’s features salads, small plates, shellfish and pizza with a chef-driven focus. Executive Chef Johnny Shipley from Country Club is in charge of the menu, which includes creative creative and fun options. Take, for instance, the Hellbabe pizza: tomato sauce, mozzarella, Marksbury Farm/Smoking Goose salami piccante, red onion, pepperoncini, parmesan and hot honey. You can also build your own with toppings like Calabrian chili sauce, fermented serranos, Taleggio and Country Club brisket. Dogwood Home Furnishings will be having their grand opening weekend starting Thursday, February 7th at their store on Winchester Road. They invite everyone to explore their collection of globally-inspired American made fine furniture. Find them on Facebook for the latest updates. Ready for an experience unlike anything else in town? Get colorful on Ashland Avenue when Color Chaos opens this month. This fun attraction brings even more excitement to the Warehouse Block area! The concept is thrilling: groups participate in five colorful games, from trivia to avoiding lasers like a super spy. It all culminates in a paint blast that requires every participant to don a protective suit. All of these elements make Color Chaos an exciting hour-long experience. It’s perfect for corporate events, parties and friends who like puzzles and adventures. Located across the street from Breakout Games, the Color Chaos team is ready to make a whole lot more fun. The rich heritage of Lexington’s first hospital will be front and center for a newly rebranded health system. CHI Saint Joseph Health will replace the KentuckyOne Health name as part of a new vision and strategic plan to focus operations in central and eastern Kentucky. The new name also renews the health system’s commitment to the caring and innovative legacy of the Sisters of Charity of Nazareth. RELOCATION: Lexington Diner has moved to Lane Allen Road! One of Lexington’s favorite eateries has moved across town. Lexington Diner now occupies the former Brasabana location on Lane Allen Road. The location provides ample parking and more space with comfortable seating. The move was announced last fall when Brasabana closed after four years. The Lexington Diner team is still offering the classics that made them a local must-visit spot, but they’re also now serving breakfast all day! Fans will be thrilled to know that the new location means Lexington Diner was able to secure a liquor license, adding alcohol to their menu.